Does anyone know the type of light bulb used on the decklight fixure? You can save me a second trip up the mast if you can let me know. I may also replace the steaming light as well if youknow the type as well. I took some scratchy notes when I replaced these lights on our 2005MKII. The Steamimg light/Decklight was one unit- Hella Marine 8505. The Deck lamp was a 12V 20W Halogen with builtin reflector. I noted the lamp was an MR16 with a GU5.3 Base (two pins). I did not write down the steaming light info. Google search Hella 8505 and it will likely detail the lamps. I'm assuming no changes between the years of our two models. A quick look through a pair of binolculars should be able to confirm. It appears that the new model is square and the model number is 8504. Why not replace with a LED bulb? LED is a good option - but I need to know what type of base is needed. Have you replaced yours? What did you use? 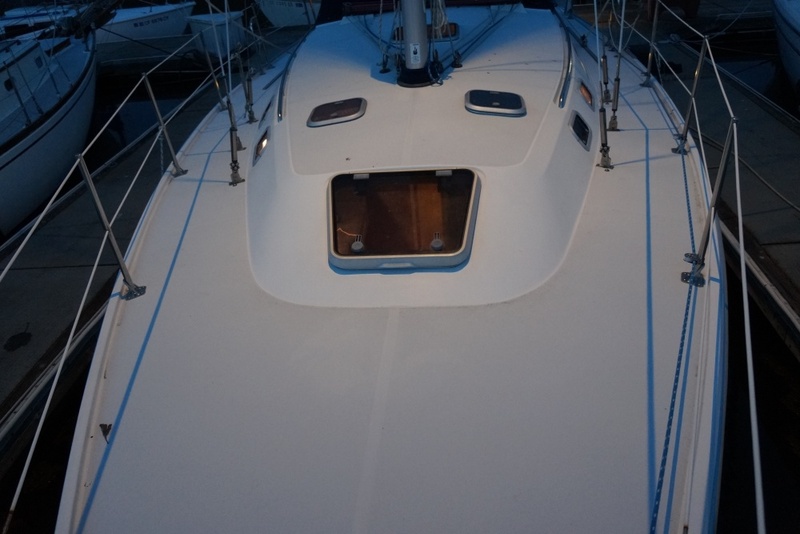 From your picture- It looks like you have the same fixture as on our '86 C30. The deck light was a 12 volt 2 pin ~20 watt holgen bulb that utilized a reflector built into the plastic decklight housing. The steaming lightbulb was about a 2" long tube shaped incondescent light with dimpled endcaps that snapped into place on copper connector arms (I don't recall the model number but maybe it's spec'd by the manufacturer.) 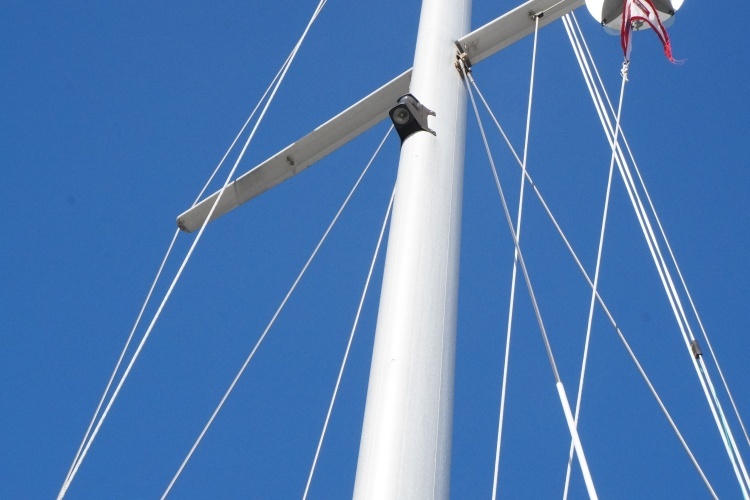 I think the same (steaming light) bulbs are used in the bow and stern lights. I am pretty sure that there are LED designs that would fit the existing fixtures- either from NAPA or West Marine. Not sure if an LED could match the Halogen deckight brightness and still fit inside the reflector- or- if it would hold up to the weather elements as this light has no cover. I thank you all for hepling provide information on this light fixture. 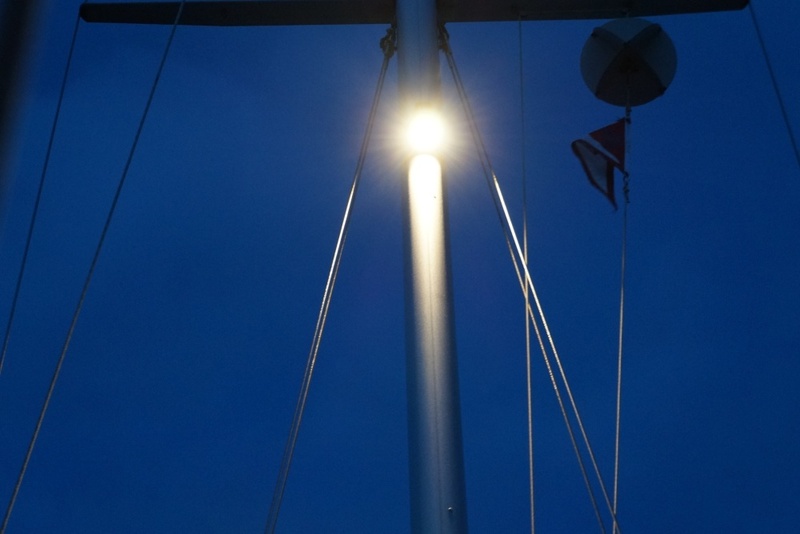 It helped me to have a replacement LED bulb in my hand while I climbed the mast and replaced with only one climb. 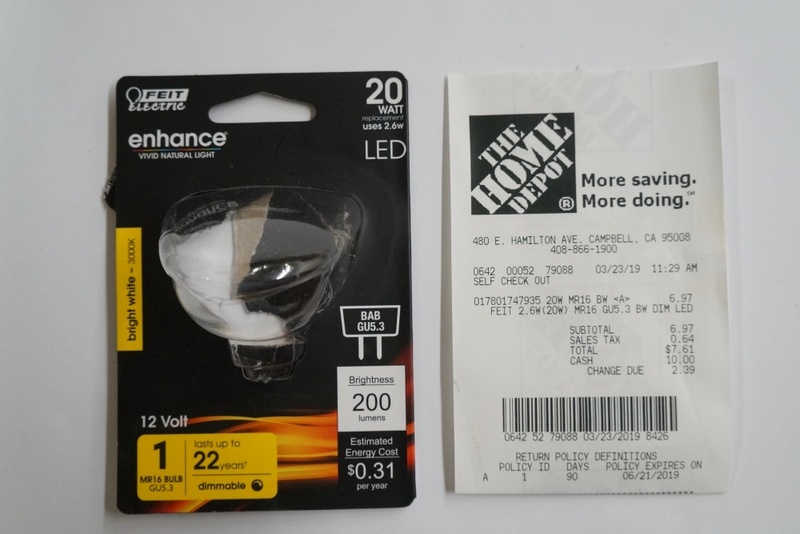 Here is what I found: You can puchase the LED replacement bulb from Home Depot for $6.97. It is 12VDC 20Watts, non-polarity sensitive. I also tested with engine running which increases the DC voltage to 14.6 Volts. All is good so far. Please note - the break-out image shown here is 8504. 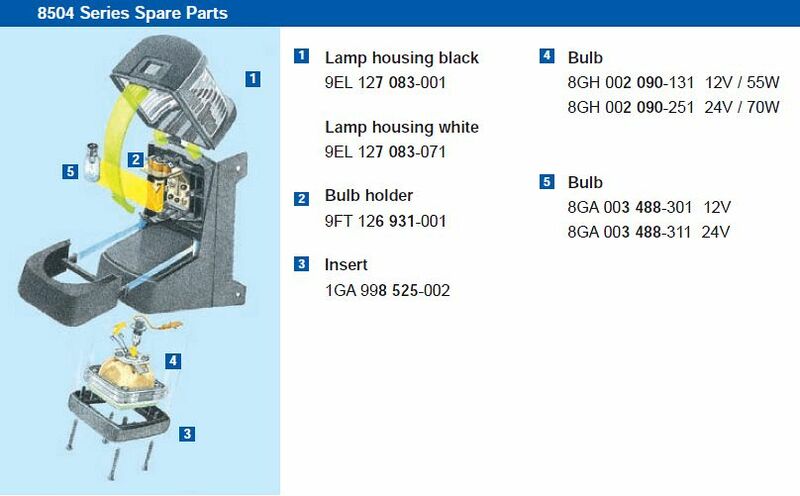 It shows that you must remove 4 screws to replace the bulb. On 8505 - you only need a small screwdriver to open the hinged door. Please downlaod the PDF file and vew the details.